For those of you who are only here in attempt to quickly google the difference between DD and FD transmission, I’m going to give you the answer up front, and then derive/explain below. In density-dependent transmission, the per capita contact rate between susceptible (S) and infected (I) individuals depends on the population density. So, transmission rates increase with density. In frequency-dependent transmission, the per capita contact rate between susceptible (S) and infected (I) individuals does not depend on the population density. So transmission rates do not change with density. Where S is the number of susceptible individuals, I is the number of infected individuals, and N is the total number of individuals in the population. (If you’re new to differential equations, the dI/dt part says “the rate of change in the number of infected individuals with respect to time is equal to….”) You’ll notice that for DD, there is a variable B, and for FD, there is a variable B’. Both of these variables are transmission rates. However, I use the prime to indicate that while B and B’ can be equivalent under some circumstances, B =/= B’, which is a very important distinction that most textbooks do not make. How and why are B and B’ different? Why does that DD equation have just an I, while the FD equation has an I/N? Where λ and λ’ are the force of infection terms. Again, the prime means that λ =/= λ’. As you can see, the reason that λ =/= λ’ is because c =/= c’. Furthermore, remember the transmission rates B and B’? Well, B = c*v and B’ = c’ * v. So the reason that B =/= B’ is also because c =/= c’. We’ve partially answered Question 1! But before we can go any further with our transmission equations, we need to figure out why the c and c’ are different. Remember that these rates are the probabilities/rates that a single contact happens between individuals in the population – for short, we call them contact rates. Dr. Green is going clubbing. Dr. Green can either go to Club 1 or Club 2. It is flu season, and while deciding which club to frequent, Dr. Green wonders whether Club 1 or Club 2 is better for avoiding disease transmission. (I’m sure everyone uses this as the criteria for finding a good club.) 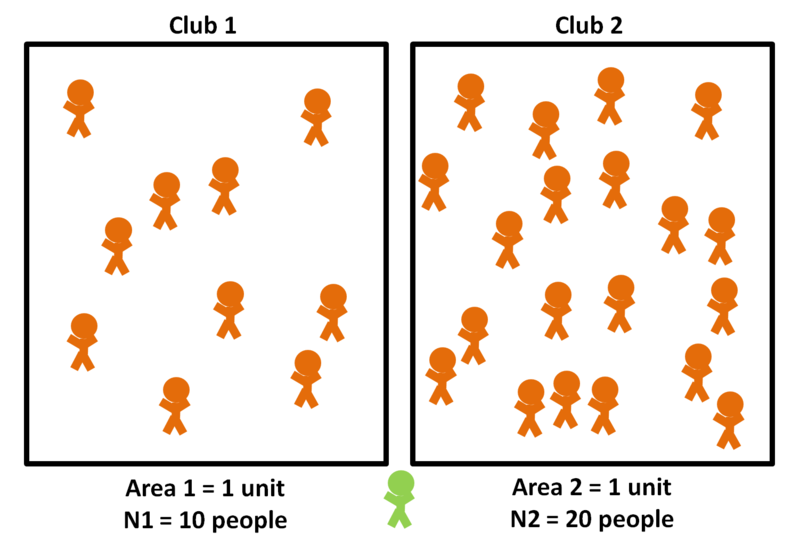 The two clubs are exactly the same size (A1 = A2 = 1), but Club 2 always has more people than Club 1 (N1 < N2; i.e., Club 2 has a higher density). Dr. Green realizes that the contact rate with other people will be higher in Club 2 because the density is greater. That is, the contact rate (c) is density-dependent. The more people in the club, the more likely Dr. Green is to get close enough to one of them to acquire some of their germs. We can summarize what we’ve learned about contact rates in DD and FD transmission in a graph. In DD transmission, the contact rate (c) increases with the population density, where density is just the total number of individuals in the population (N) divided by the area (A). We usually assume that the relationship between c and N/A is linear, with a slope of k. However, we don’t need to assume a linear relationship if a different shape makes more sense. 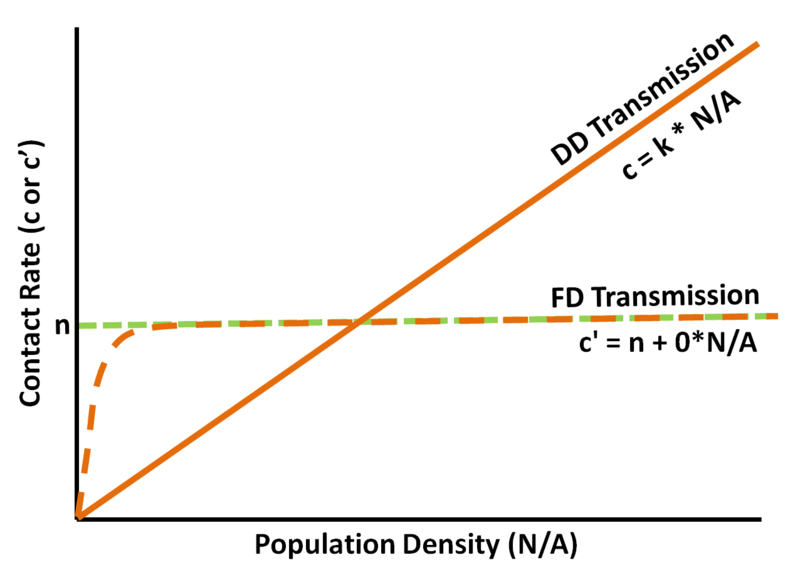 In FD transmission, the contact rate (c’) is usually not affected by the population density (N/A) – see the green dashed line. That is, the line for c’ has an intercept of n and a slope of 0. The caveat being that at in some cases, c’ does increase with density at very low densities – see the orange dashed line. We’ve officially answered Question 1! That is, B and B’ are different because c and c’ are different. Specifically, c is a function of density, and c’ is a constant. Why does FD Transmission Have an I/N? Finally, let’s answer Question 2: why does the DD equation have an I, but the FD equation has an I/N? Let’s go back to our equations, but instead of using the conglomerate FOI term, we’ll look at the rates c or c’, v, and I/N. Therefore, DD has an I while FD has an I/N because there is an N in the contact rate (c) for DD transmission that cancels with the N in the denominator. Because c’ is not density-dependent, it does not have an N component, so the N in the denominator does not cancel out. This section is for more advanced readers. You don’t really need to understand this to understand the basics of DD and FD transmission. If you’re trying to decide whether DD or FD transmission make more sense for a given parasite/pathogen system, you need to decide whether contact rate is density-dependent or not. If you’re modeling professionally, I recommend that you 1) read the Begon et al. (2002) paper as well as others (e.g., McCallum et al. 2001) and 2) consider N and A very carefully. We very often assume that the area that a population occupies is constant, or that the areas occupied by multiple populations that we are comparing are equivalent. Sometimes those assumptions are reasonable, and for DD transmission, we can say that dI/dt = B * S * I. But those assumptions are often 1) not reasonable and 2) not even evaluated, so it is safer to start by thinking that dI/dt = B * S * I/A. If A is constant AND N is constant, then the density is constant. And if the density is constant, both c and c’ are constants. Furthermore, under this scenario, density-dependent and frequency-dependent transmission equations yield the same results. If A is proportional to N – for instance, if the population occupies a larger area as it grows – then the density is constant, and FD transmission is the correct model. Again, I highly recommend taking a look at Begon et al. (2002). Let me know in the comments if anything was particularly unclear, and/or if you have suggestions for improving this post. Also, if you’re wondering if we get more than two options – just FD and DD – check this out. This entry was posted in Cool Literature and tagged contact rate, Density-dependent transmission, force of infection, frequency-dependent transmission by dinoverm. Bookmark the permalink. Very well and engagingly explained. Thanks. As a PhD student studying disease ecology, I found this very insightful. Howdy! I simply want to give an enormous thumbs up for the great information you��ve here on this post. This sure saved my but… I enjoy the club analogy…!! I really thank you very much and appreciate you for the explicit explanation. It seems I am having face to face conversation with and the explanation made me to imagine the difference between FD and DD. But, I didn’t get you why A is cancelled out from DD? Why other books/papers use FOI as the same for DD and FD? A isn’t really “canceled out” in the DD transmission function. If the area that the host population occupies is fixed, then you can say A=1, and then you don’t need to explicitly include area in the function. However, if the area is not fixed, you definitely need to include that term in the function. I’m not sure exactly what you are referring to in your last question. The force of infection can use DD or FD transmission functions, so certainly the term “force of infection” is used models with either transmission function. Does that answer your question? Saved my time and effort. 1000 thanks. Really helpful! Thanks very much! So I’m a long-time reader of your blog, and i’m not going to lie, some of your examples have really saved me in terms of explaining “math” to the self-professed “non-math-ers.” In fact your explanation of the Begon et al. paper helped me in the past when building my own model for a conference. However, I’m about to put together an experiment and am really hoping (desperate) for any feedback in interpreting the variables above, i.e. c * v * I/N into actual data, i.e. infectious and infected hosts within a controlled setting with swab data collected over discrete time points. Hi Andrea! Thanks for your note! I never put my work email on the blog, but you can send me an email at dinoverm@gmail.com and I’ll get back to you ASAP. Hi, Please could you send details about Begon paper as the link is no more available! models: numbers, densities and areas. Epidemiol. Infect., 129, 147–153. Initially B=c*v and c=k*(N/A). But later how does B=k*v?? You “plug in” c=k*(N/A) into B=c*v and simplify. So really it should be B=k*N/A*v, but the N is canceled out in the rest of the FOI equation and we assume A=1. Does that help? This was great. Made it all so much easier to get my head around!